As some of you know, I spent the summer interning for the Maine Sierra Club on the Tar Sands Free Northeast campaign. 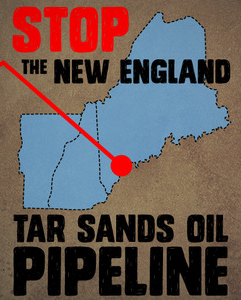 There is a plan to pump tar sands through an existing pipeline from Canada through New England and down to Portland, ME. It would run through communities, under homes, under rivers, around lakes, and into Casco Bay. The plan, called Trailbreaker, would devastate local economies, tourism, and marine life. Tar sands is an ugly ugly substance. A mixture of clay, sand, water, and bitumen (a hydrocarbon that can be processed into crude oil), tar sands is extracted from under Canada’s Boreal Forest. It is a gooey tar-like substance that must be diluted with toxic carcinogenic chemicals to get through a pipeline. Compared to conventional oil, it is 70 times more viscous, 20 times more acidic, and has three times the spill rate. Producing crude from tar sands also emits three times more greenhouse gas emissions than producing conventional oil. No one wants that to run under their feet let alone be burned into the air. Individuals and organizations around New England are coming together to take a stand against Trailbreaker. On January 26th, there will be a huge rally in Portland, ME to voice opposition to tar sands and fossil fuel infrastructure expansion. This is a crucial fight that requires individuals to take a stand and use their collective power to stop Trailbreaker. So save the date and march in Portland on January 26th. EDIT: Check out this article the New York Times about how tar sands leads to higher carcinogen levels in water sources.